This is the announcement by Marvel Studios of a second trailer for the upcoming Doctor Strange movie, the trailer was revealed at San Diego Comicon and they are clearly very excited about it. The film is scheduled for a November release and the hype train has already started. The film is directed by Scott Derrickson who also co-wrote the screenplay with C. Robert Cargill. The film’s cast includes Benedict Cumberbatch as the titular character, along with Rachel McAdams, Chiwetel Ejiofor, Benedict Wong, Benjamin Bratt, Tilda Swinton and Mads Mikkelsen. Principal photography began in Nepal late 2015, with filming also taking place in the United Kingdom and New York. 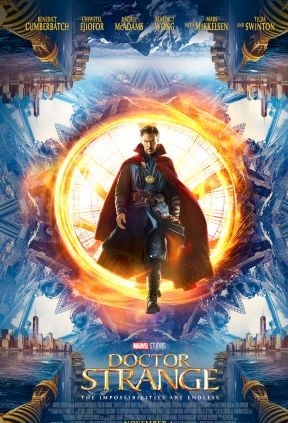 Doctor Strange tells the story of Stephen Strange, an acclaimed neurosurgeon who uncovers the hidden world of magic and alternate dimensions after a near-fatal car accident. In the film he encounters the Ancient One who becomes Strange’s mentor in the mystic arts. Originally created by the legendary Steve Ditko, the character first appeared in 1963, in Strange Tales #110. The comic book series focuses on Strange serving as the ‘Sorcerer Supreme’ – the primary protector of Earth – and his battles against mystical and magical threats. Doctor Strange is scheduled to be released in the United States on November 4, 2016 in 3D and IMAX3D.